DENMARK – The young woman behind the Denmark basket in charge of The Zane Short 1,000-point Countdown Board was on high alert, eraser and marker both at the ready. No sooner had she changed the white board from 8 to 6 than she had to hurriedly clear that and scribble a 4. The point is, it doesn’t take long for Zane Short to pile up points. Of his team’s 28 field goals against Wrightstown on Friday night, the 6-5 Viking senior had half of them. He finished with 36 of Denmark’s 73, though it was in a heartbreaking overtime loss to the arch nemesis Tigers. Less than half a minute after a driving layup drew Short to within two points of the 1,000-point career milestone, he went to the line, and two perfect free throws later, the countdown keeper’s night was over. Zane Short had just joined a very special class of players to reach the coveted milestone, becoming the sixth Viking to enter the club. Blake Derricks last did it two years ago, piling up 563 points in the 2016-17 season and concluding his career with 1,211 points. Dan Kuehn scored 1,267 points in the mid-1980s and tops the Denmark scoring list. 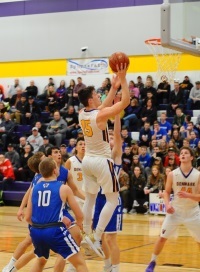 By adding 28 more points after his grand accomplishment, Short surpassed Bob Olsen – also from the mid-80s – and is currently the fifth-leading scorer at the school with 1,026. Short is just the third Viking boy this century to reach a thousand. “When they told me I was making varsity as freshman, I thought if I have four years and am putting in the time, it shouldn’t be an issue,” Short said of the achievement. “When you get four years to do something you ought to be able to do it. 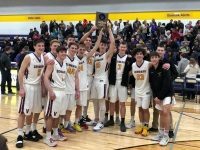 If that sounds less celebratory than you might expect, it’s probably because his team had just been beaten in overtime in a critical North Eastern Conference battle with Wrightstown after the Tigers hit an improbable buzzer-beating three-pointer at the end of regulation. 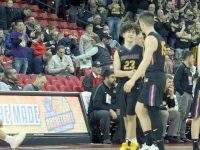 “I know Zane would be the first to tell you it doesn’t mean anything to him with the loss,” said Denmark head coach Cody Stelmach. Though Short compiled 363 points last season – good for a 15.1 average – it is through the first 11 games of his senior campaign that he has ascended to the next level. His ability to get to the basket, his improved outside shooting and better midrange touch, his offensive rebounding skills – all have made him an even bigger weapon as 2019 begins. “Zane is an explosive athlete that can score in bunches,” said Little Chute head coach Jack VanRoy. “His ability to score from all three levels — the three, the midrange and at the cup makes him extremely hard to defend. Zane is always a player that opposing coaches are worried about because of the match-up problems he creates. The lanky forward is shooting 57 percent overall – 40 percent from three — while averaging better than 25 points and 7.6 rebounds. He has scored 71 points in his past two games. What makes Short all the more valuable is his dynamic court vision and passing ability. He is leading the conference in assists, dishing out 3.5 per game. Short has also improved in almost every statistical category from his sophomore season on – including scoring average and shooting percentage. “I feel I’ve gotten a lot more comfortable using my body to my advantage,” Short said. “Back when I was a freshman I didn’t really know how to move. A lot of it is growing up and figuring out who you are and working hard outside of the normal school season and just becoming more comfortable with being on the floor. Short plays with open emotion, wears white tights under his shorts and often dons an arm sleeve. He can on occasion shoot plaintive looks at officials. All of this makes him a prime target for opposing fans, who don’t hesitate to jeer and taunt him. 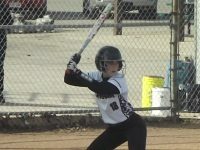 But Short has gotten the last laugh almost exclusively this year, helping to lead the Vikings to an 8-3 overall mark. They are tied with Wrightstown, currently one game behind first-place Freedom. 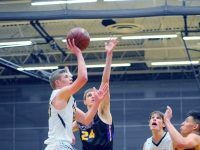 It’s hard to say whether Short has been able to put up his numbers in spite of or because of the injury to fellow-Viking star Brady Jens, who has missed all but one-and-a-half games with injury this season and is due back this weekend. Jens, by the way, is only 65 points away from joining the elite 1,000 club. There’s no doubt Short has been asked to take on more of a scoring role after losing Jens’s 14.6 points a game over the past 10 contests. It has also, of course, allowed opposing defenses to focus more on Short. But Short has the ability to get to — and finish — at the rim against multiple defenders and has often had to do just that. 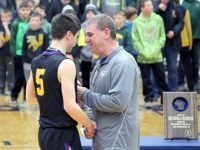 Despite containing Short as well as anyone has during his years as head coach at Marinette, Nick Semenas said Short was always one of his main focuses. Short probably has as at least 13 – and likely, several more – games to move up the scoring charts at Denmark. He would need 241 points (he has 244 through 11 games so far) to reach Kuehn, so it’s quite conceivable that he could be the top-scoring Viking by the time he leaves. And as the league’s second-leading scorer, top assists man and fifth-leading rebounder, he is one of a handful of contenders for North Eastern Conference Player of the Year. Short’s focus, though, is on making sure this group of Vikings does something special. Over the past 10 seasons, Denmark’s best finish in conference play is fourth. “I think out of anything that has to do with the conference, instead of the player-of-the-year thing, I’m more interested in us getting a conference championship,” said Short. “That’s really all I’ve wanted over the past four years. I really want to bring a winning program and a winning attitude here.